The pinnacle of light, luxury and stunning views awaits you in this incredible space atop Houston’s most enviable address. 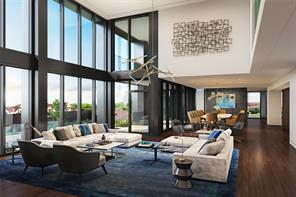 This 7,900 square foot penthouse is being sold to the slab and ready for your customization. 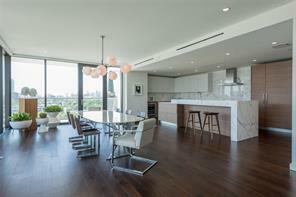 The large 1,700 terrace enhances the allure of this one-of-a-kind residence with panoramic unobstructed views. 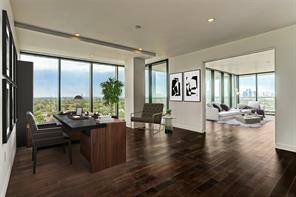 The 14’ floor to ceiling glass walls provide incredible natural light and will take your breath away. Nestled on nearly 3 acres of beautiful grounds, The River Oaks is a modern and sophisticated luxury condominium. Paper City magazine has stated, “The River Oaks is the most anticipated new high-rise of the decade, possibly of the last 30 years within River Oaks”. 5-star level service and amenities that include: two resort style pools, pet grooming spa and dog park, massage therapy room, yoga/Pilates studio, fitness center with Peleton bike, valet parking and white glove concierge service. Call and schedule your private presentation. Live at Houston’s most enviable address! Nestled on nearly three acres of perfectly manicured grounds, The River Oaks — a modern and sophisticated luxury condominium — offers estate-size homes with spectacular unobstructed views of Houston. PaperCity magazine has stated that, “The River Oaks is the most anticipated new high-rise of the decade, possibly of the last 30 years within River Oaks.” Each residence is equipped with Poggenpohl cabinetry, chef-caliber Gaggenau appliances and Calacatta marble countertops. Delight in five-star level amenities that include: resort style pools, pet-grooming spa and dog park, massage therapy room, yoga/Pilates studio with Peak Pilates MRe Reformer, 24-hour fitness center with Peloton bike, 24-hour concierge, and 24-hour valet parking. SALES MODEL OPEN DAILY. APPOINTMENTS SUGGESTED. MOVE IN READY! 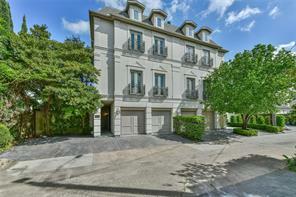 This exclusive River Oaks Area gated enclave of Sutton Court is one of the best kept secrets inside the loop. Beyond the gates, this elegant and sophisticated garden home perfectly combines art and function with posh interiors accented by sleek designer touches and warm, inviting living spaces. The floor to ceiling windows in the back of the house provide abundant natural light and a perfect view of the 2 private outside entertaining areas. Open concept kitchen, family and breakfast areas give way to more formal library and dining rooms providing the best of both worlds. Luxurious master suite with sitting area, large walk-in closet/dressing room and 2-sided his and hers bathroom vanity areas. 2 other bedroom suites on 2nd floor. 3rd floor flex room with full bath could be game/media room or 4th bedroom. Lots of storage. Elevator to all floors. Whole home generator. Close to Central Market, Highland Village & Upper Kirby restaurants and shops. Custom built 4 bedroom, 3 bath residence. A true home in the sky. Taken to studs - reconfigured floor plan. Open gourmet kitchen. Hardwoods, custom moldings/cabinetry. Master suite w/home office, large closet & luxurious bathroom. Walk-in utility rm. Extensive storage. Media rm./4th bdrm. High end finishes. 3 replaced HVAC systems/duct work. 2 balconies. 4 parking spaces. Spectacular 22nd floor panoramic views. Full service high rise w/convenient central location. Doorman, valet, porter, 24 hr. security, heated pool & more! 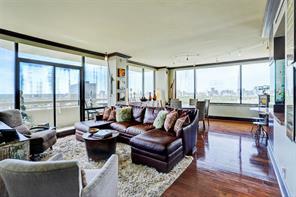 Spacious 21st floor renovated home in the sky boasts 3,017 sq.ft. expansive living areas include a large living room, dining, den, kitchen with breakfast room, 3 bedrooms, 3 full baths, kitchen with custom cabinetry, quartz counters, subzero refrigerator & wine cooler, wolf oven and induction cooktop. Den easily converts to a 4th bedroom. Master suite with electric solar shades, walk-in closet and marble bathroom with steam shower and soaking tub, oversized tile floors, 2 private balconies, 4 assigned parking spaces. Full service high rise living with doorman, valet, porter, heated pool and central location close to great shopping, dining and freeway access. 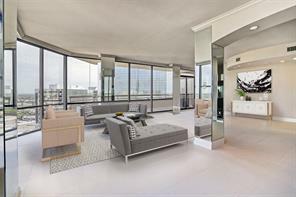 Expansive 29th floor penthouse boasting 3,017 sq. ft. Gracious floor plan offers a formal living, formal dining, den, study open to living area, wet bar with extensive storage. Island kitchen with custom cabinetry, quartz countertops, stainless appliances, double ovens, built-in refrigerator, warming drawer and breakfast bar. Den open to the kitchen with full wall of custom built cabinetry. Great art lighting and automatic solar shades. Large master suite offering two walk-in closets, private bath with large tub. Secondary en-suite bedroom with balcony access. Oversized walk-in storage room, currently used as a study nook. Walk-in utility room with laundry sink. Two private balconies. Sweeping views of Greenway Plaza, the medical center, NRG Stadium and Williams Tower. 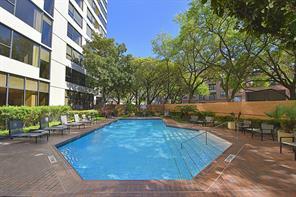 Full service high rise living with 24/7 security, valet, porter, heated pool. 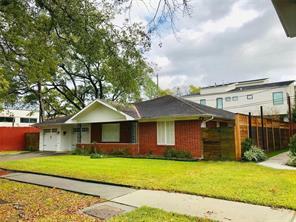 Wonderful central location with easy access to freeways leading to the Galleria, Downtown & The Medical Center. 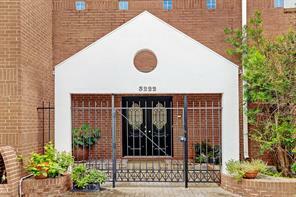 Rare opportunity to live in coveted Saint Place. 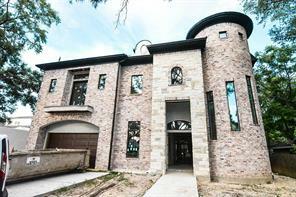 Stunning 2 story traditional patio home with gated entry. First floor features formal living room with beautiful hardwoods, lovely built-ins, crown molding, large wood burning fireplace, and plantation shutters. Dining room has beautiful hardwoods, gorgeous chandelier, and plantation shutters. 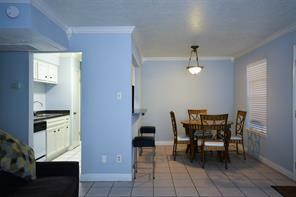 Over sized kitchen and breakfast room are perfect for family gatherings and entertaining. Powder room on 1st floor. 2nd floor has utility room, 3 carpeted bedrooms and 2 baths. Master suite is spacious with great closet space and a luxurious master bath with 2 sinks and separate shower and tub. 3rd floor has a finished carpeted bonus room that could be used as a playroom, office, craftroom, exercise room, etc. Beautifully landscaped. 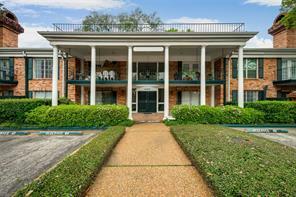 Excellent location convenient to Greenway Plaza, Galleria, Highland Village, and Medical Center. NEVER FLOODED per seller. 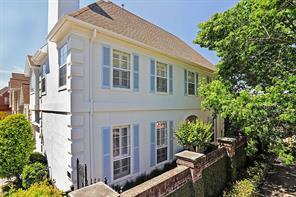 Charming traditional 2-Story town home with 1st floor main living areas. Nestled in the back row far from the roadway in prime Highland Village area gated enclave. Light and bright interior with large windows afford expansive views of the lush rear yard & stone patio. Spacious island Kitchen with bay window in the breakfast area / Dramatic curved staircase leads to 3 bedrooms on 2nd level (Master, Master Bath, & Bedroom #3 feature raised ceilings) / Large allocation of space within the Master Suite affords a dramatic bath & 2 generous walk-in closets / Plantation shutters. Surrounded by brick walls, this superbly updated home is secluded in a cul-de-sac w/in exclusive Alabama Court, one of the River Oaks’ areas most desirable enclaves. An inviting gated courtyard entrance introduces the airy foyer. Expansive living room features French doors overlooking the slate terrace, cocktail pool, and spa. A walk-in bar positioned between living and dining rooms offers Blue Pearl granite countertops, sink, and a service window to the pool. Dining room has a glass door to the pool; updated, light-filled kitchen adjoins a breakfast or sitting room w/ access to a second patio. Master suite has a vestibule entry, juice bar, marble-clad fireplace, French doors, two balconies, and two walk-in, custom-fitted cedar-lined closets. Updated master bath offers twin vessel sinks w/ a granite deck; custom lighting; oversized glass-front walk-in shower; soaking tub w/ shower head; and private water closet. Home office/den/3rd bedroom shares updated bath w/ spacious guest bedroom. 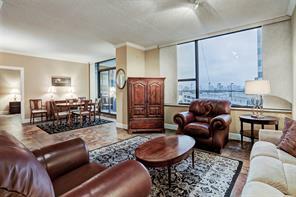 Custom 3/2 corner unit with amazing 23rd-floor views. Open gourmet kitchen with island/breakfast bar, built-in Sub-Zero, dishwasher drawers, granite counters and generous cabinetry. Hardwoods, solar shades, neutral tones, extensive recessed lighting. Master suite with a private balcony, walk-in closet and bathroom with an oversized shower. Guest bedroom with built-in Murphy bed. 3rd bedroom offers built-in cabinetry, sectional sofa, sisal flooring and antique double doors. Guest bath w/seamless glass shower, oversized tub and designer fixtures. Full service high-rise living with doorman, valet, porter, heated pool and central location close to great shopping, dining and freeway access. SOPHISTICATED CUSTOM RESIDENCE OFFERS AN EXPANSIVE LIVING ROOM, FORMAL DINING WITH BUILT-IN BUFFET AND CABINETRY, HARDWOOD FLOORS, ACCENT LIGHTING, NEUTRAL TONES. KITCHEN WITH GRANITE COUNTERS. MASTER SUITE WITH SITTING ROOM, WALK-IN CLOSET, EXTENSIVE BUILT-IN CABINETRY AND ADDITIONAL CLOSET SYSTEMS. DESIGNER FINISHES. 2ND BEDROOM CURRENTLY USED AS A DEN. SHOWS BEAUTIFULLY. FULL SERVICE BUILDING CLOSE TO GREAT SHOPPING AND DINING, CONVENIENT FREEWAY ACCESS. DOORMAN, VALET, PORTER, 24 HR. SECURITY, HEATED POOL. 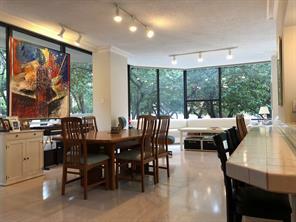 Spacious 2/2 corner residence offers a beautifully renovated kitchen and baths. 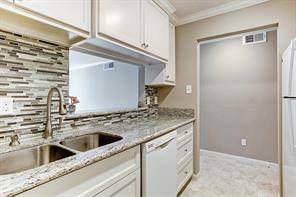 Brookhaven custom cabinetry, stone counters, Bosch stainless appliances and tiled floors. Neutral tones, crown molding, draperies and parquet wood floors at living areas. Generous room sizes, private balcony and serene views. Master bath with marble floors, double sinks, granite counters, brookhaven cabinetry and an over sized carrera marble seamless glass shower. Guest bath with a large soaking tub, brookhaven cabinetry, granite counters and a full size stacked washer/dryer. 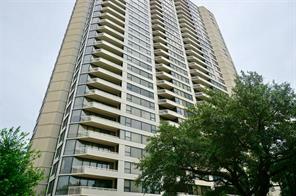 Full service high rise living with a convenient central location: doorman, valet, porter, 24 hr. Security, heated pool and more! PRICE REDUCED. 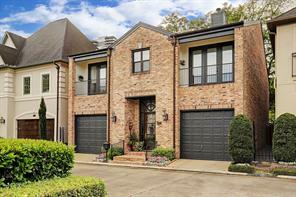 Beautifully updated 3 story 3 bedroom, 3 1/2 bath townhouse near Greenway Plaza, River Oaks, and West U. The open floor plan has new carpet and fresh paint. Kitchen has new quartz counters and backsplash. Chefs will enjoy the stainless steel appliances and gas stove. Hardwoods in living areas and kitchen. Secure, small complex with security gate. Large master with 2 closets and luxurious bathroom with separate spa tub and shower. Plantation shutters throughout. Private patio for your grill and patio furniture. Refrigerator and washer and dryer included. Garage has new epoxy floor coating. Easy access to I 59 and close to great restaurants and shopping. Awesome location and never flooded! OWNER/AGENT. Wonderful opportunity to acquire largest floorplan in coveted Park St. John Condominiums, a quiet, secure 115 unit complex. One of only six units this size, this ground floor end unit features 2 bedrooms, 2 baths+ den with high ceilings, hardwood floors in living areas, wood-burning fireplace, fresh carpet (April 2018) in bedrooms, new (July 2018) sliding door to living area patio, updated kitchen with granite counters and stainless steel appliances (2012),& full size washer/dryer. Additional private patio off Master Bedroom. Master bath offers walk- in shower and nice vanity area. A/C replaced (2016) with 10 year warranty. Paint freshened rooms (2017). The ultimate luxury: reserved covered parking space at back door!!! with additional reserved uncovered parking spot nearby. Rainy days and groceries are no longer an issue. This complex has two community pools. Excellent River Oaks area location. Easy access to Highland Village, shopping & eateries. 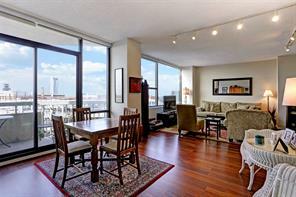 Full service high rise living with a convenient in a central location. 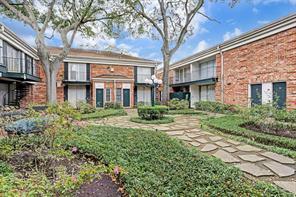 Close to Gallera Mall, Rice village Center, Sports Stadiums and downtown Houston. Full service amenities include doorman,valet parking, heated pool, 24 hr securty. walk to Church. 19th floor panoramic sunset views overlooking the Galleria skyline! Granite floors at entry and kitchen, hardwoods at breakfast room, living and dining. Corner residence with spacious floor plan. Walk-in storage closet. Great opportunity for buyer to complete preferred updates. 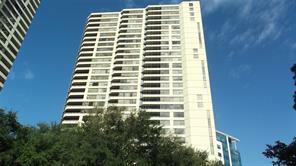 Full service high rise living w/24 hr security,valet, porter,heated pool. Wonderful central location w/easy access to freeways, the Galleria, Downtown & The Medical Center. 16TH FLOOR 2/2 WITH RECENT TILE AT ENTRY AND KITCHEN. STAINLESS APPLIANCES, GRANITE COUNTERS AND OPEN BREAKFAST BAR. HARDWOODS AT LIVING ROOM AND BEDROOMS. GALLERIA SKYLINE VIEWS. 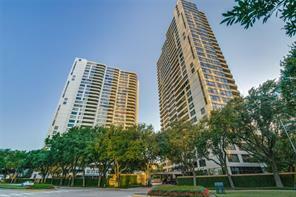 FULL SERVICE HIGH RISE LIVING WITH 24 HR. SECURITY, DOORMAN, VALET, PORTER, HEATED POOL. CLOSE TO GREAT SHOPPING AND DINING. 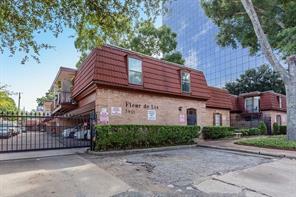 EASY FREEWAY ACCESS TO DOWNTOWN, MEDICAL CENTER AND THE GALLERIA. Welcome to 15 Greenway, a full service high rise! 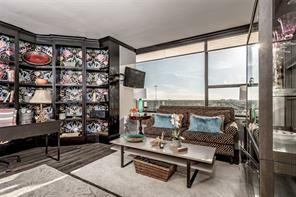 Over $25,000 in upgrades and updates added to this unit located on the 19th floor with TONS of natural light and beautiful views of Houston from your balcony that will fit a bistro set. Updates include silestone countertops, subway back splash, new Kitchen Aid dishwasher, tile and wood laminate floors throughout the home(no carpet!). With spacious and open floor plan, the living/dining room is also large enough to include a study area. HOA fees include 24/7 residence services & maintenance, water, sewer, trash chute, free valet, porter, heated swimming pool, and 2 reserved parking spots in the parking garage. 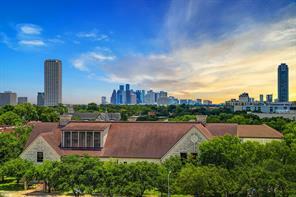 Access to Downtown, Montrose, Galleria, The new River Oaks District, Medical Center, West U , Grand place movie theater. Free Valet services, doorman, porter. Heated Pool! Building has a contract with AT&T for basic cable and internet. Buyer to complete application with The Greenway. BEAUTIFUL 2/2 WITH RECENTLY UPDATED KITCHEN WITH GRANITE COUNTERTOPS, RECENT CARPET IN THE BEDROOMS, FRESH PAINT, STAINLESS STEEL APPLIANCES. BALCONY ACCESS FROM LIVING ROOM, WOOD FLOORS IN THE LIVING ROOM, MASTER BEDROOM WITH LARGE WALK-IN COLSET AND CEILING FAN. REFRIGERATOR, STACK WASHER/DRYER INCLUDED. LOVELY TREE TOP VIEWS FROM BALCONY. FULL SERVICE BLDG. W/24 HOUR SECURITY. CONCIERGE,VALET AND MUCH MORE. EASY ACCESS TO SHOPPING, MOVIES, RESTAURANTS. THIS CONDO IN CLEAN AND READY FOR MOVE-IN. Spacious 1/1 offers generous living room, master suite, and closet space. with over $25,000 in upgrades, this unit features a gorgeous kitchen with deep blue silestone countertops, large chef sink, and new KitchenAid dishwasher. 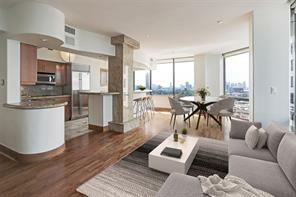 Located on the 19th floor, this home receives lots of natural light, and has a private balcony perfect for morning coffee and cocktails in the evening while watching the sunset. Greenway Condominiums is a full service high rise, centrally located near the Galleria and River Oaks, with easy freeway access to Downtown and the Medical Center. Welcome home! Spacious 1/1 offers generous room sizes, tiled floors and crown molding. Kitchen with granite counters. Renovated bathroom with an oversized shower, seamless glass and granite counters. Master suite with a walk-in closet and storage closet at entry. Private balcony. Enjoy sunset views and the Galleria skyline. Full service high rise living with a wonderful central location close to great shopping, dining and freeway access. This meticulously updated unit is located minutes from world-class shopping at the Galleria, River Oaks District and Highland Village. Medical center employees will enjoy the brief 4-mile commute to work. Quick freeway access make all parts of Houston - including Galleria, Midtown, EaDo, Heights and Downtown a short drive away. Notable features include: abundance of natural light and soaring views of greenway plaza, motorized black-out shades, smart-home ready: nest thermostat and keyless entry, the master suite includes a balcony, custom built walk-in closet and adjustable bookshelves and/or shoe storage. This home features remodeled bathrooms with Toto toilets, white marble flooring + MORE! Full service building amenities include: valet, porter, pool, and conference rooms. 2 assigned parking spots are included. Dressed to impress with its marble flooring, mood lighting and chandeliers! 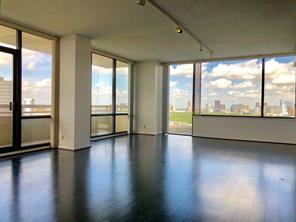 Generous 1/1 with Balcony & Galleria Skyline Sunset views! Kitchen with Granite Countertops, Wood Cabinets, Refrigerator included. Bathroom has tub shower, granite countertops and stacked washer dryer unit included. Master suite has a spacious walk-in closet, balcony access and terrific skyline views. This unit also has a large storage closet off the main entry along with a smaller coat closet. Full service high rise living. 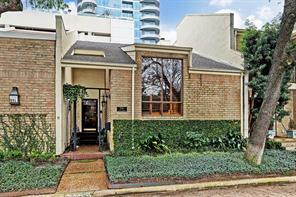 Central location with easy freeway access to Upper Kirby District, Downtown, Galleria & Post Oak Areas. Close to great shopping and dinning! 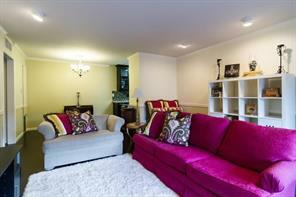 Delightful Ground/First level unit in the gated community of Park St. John Condo. No stairs to Climb! Tucked away in a great Inner Loop location surrounded by lots of lush greenery! 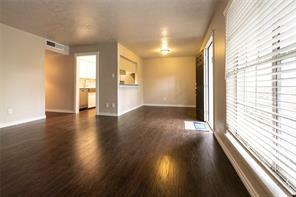 TWO bedroom/TWO bath unit with new laminate wood flooring(4/2019) in the living and dinning room. Living room with fireplace opens to updated granite kitchen with tile floors and plenty of cabinet storage. Sliding glass door from the living room takes you to a private shaded patio. Recent paint and bathroom updates. Refrigerator, washer and dryer are included. Owned by same family since the community was established. Two assigned parking spaces. Two sparkling pools provide residents with a great place to relax. Desirable location with tons of shops, restaurants entertainment right at your fingertips! Just blocks to Highland Village and Central Market. This cozzi 2 Bedrooms- 1 bath have a small 2nd bedroom converted into Study that could easily be incorporated in the Living room area by removing the walls if so desired . It offers a living room with large window for great view and natural light. Both the large master bedroom and the small 2nd bedroom/study have access to a private balcony with nice view to the swimming pool. A large walk-in closet at the entrance have an adjustable wine rack included in the price. This nice unit have beautiful and durable cork-wood flooring in the living room area. The central antique lamp in living is excluded. Two assigned parking place in garage. 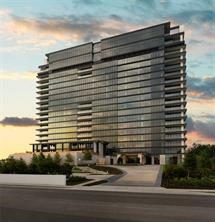 The Greenway is a full service building, including valet, porter, pool, security, and private conference rooms. Walkable location to restaurants and plenty of nightlife activities. 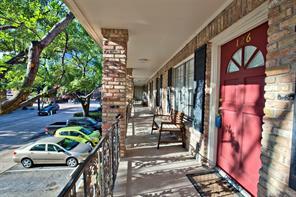 Enjoy being close to the River Oaks Shopping District or The Galleria. You will not be disappointed. Location, Location, Location! 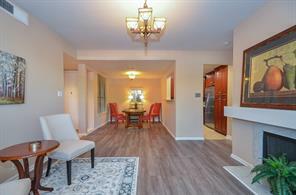 Newly and completely renovated 2 beds/2 baths unit and move in ready. An inner Loop location zoned to top ranked Lanier Middle School. 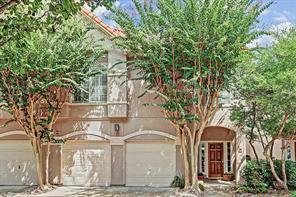 Close to Highland Village, River Oaks shopping district, Galleria, Medical Center, Universities and Downtown. All new laminate floor, interior paint, granite counter tops, cabinet doors, Farmhouse kitchen sink, stainless steel appliances. Marble floor and tiles makes the main bathroom really luxury. Main bedroom has a spacious walk-in closet. New french door refrigerator can leave to the buyer. Washer and dryer are in the Unit. Low HOA includes lovely pool, water, cable TV and security doors. NO FLOODING issues at all. This is a fantastic opportunity to own your new home inside the loop without breaking the bank! Come and see it today. 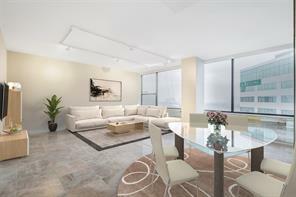 Fantastic 2 bed / 1 bath condo located inside the loop. This gated community comes with tons of amenities. As you enter the community you will park at your designated parking spot and come up to your unit. The community hallway has recently been updated with nice flooring and bright colors, making it feel more modern. Getting to your unit you are welcome with an open concept living / kitchen area so you have tons of space for entertaining. Your two bedrooms have large closets and right in between you have the nicely sized bathroom. 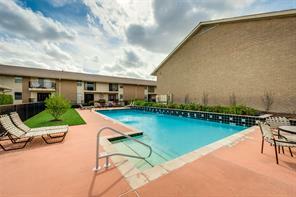 The pool is very close to this unit along with the community laundry facility. Conveniently located, you can walk to shopping and restaurants. Schedule your tour today. 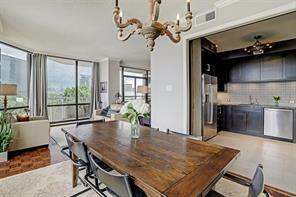 Immaculate newly updated 2-bedroom, 1 bath condominium nestled in a in a fabulous location! Enjoy this open living concept floorplan with updates that include NEW paint, tile/laminate flooring throughout, interior doors, glass patio door and new electrical fixtures. 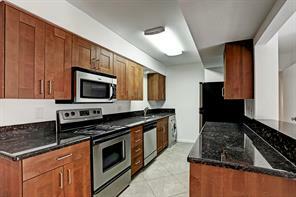 Kitchen updates include new custom-built cabinets, granite counter tops, ultra-modern back splash and new appliances. Updated bathroom features a new sink, custom cabinet, Re-porcelain tub, and a new shower. Enjoy the weekends in the large resort like pool and its BBQ pits. Other amenities include a private laundry facility and a community meeting room. ALL BILLS PAID: includes electric, water, cable, insurance plus amenities. Don't miss your opportunity to see this gem and make it your own today! 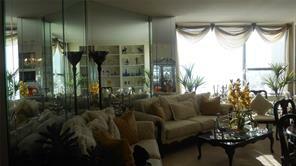 Two bedroom condo in gated Greenway Plaza area complex. Walk to area restaurants & shopping. Features include tile in kitchen & living area, berber carpet, balcony, refrigerator included, reserved covered parking spot & whirlpool tub in bath. 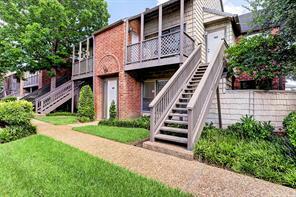 Beautifully updated condo in the centrally located Greenway Plaza area. This 1 bedroom 1 bath unit overlooking the community pool offers an open layout with a spacious dining area that could allow for an office nook if desired and a well appointed living area. One underground parking space is included along with a dog run and dog waste areas, on site laundry facility and sparkling pool. The walkability is endless from this location - LA Fitness, Costco, many restaurants like Collinas, Oishii, Tiny Boxwoods and much more! Zoned to desirable schools! Maintenance fee includes electric, water, basic cable, exterior insurance & community maintenance. Gorgeous Condo. Granite countertops, new refrigerator, crown molding, neutral paint colors, double pane windows, spacious rooms, walk in closets, cozy court yard, and assigned parking. 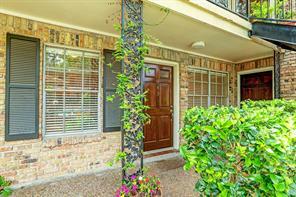 This condo is minutes from downtown, Galleria, and walking distance to nearby shops. A MUST see for your future home. nice and quiet gated unit, well maintained with tiles throughout the unit. zoned to Great Schools, low maintenance fee. come to see it and make it your home. Updated GROUND floor unit overlooking the POOL! Low hoa fees that cover water bill, GREAT location within the complex and has its own assigned covered parking space. TWO closets in the bedroom (HUGE walk in closet and another closet in the bedroom). Condo features wood floors, tile flooring in kitchen and bath. Granite counters, tile backsplash, stainless steel refrigerator and dishwasher. On site laundry and beautifully landscaped courtyard in addition to the pool. YOU DON"T WANT TO MISS THIS UNIT! New Orleans Style two story townhouse. Low Home Owners Association fee $190. Located in the Bustling heart of Greenway Plaza. Don't let this darling town home pass you by. 1 Bed 1/ Bath with Half Bath Capability. Owner has added a deep freeze in 1/2 bath closet. (Does not come with home) Upon walking up to the gorgeous landscaped courtyard. 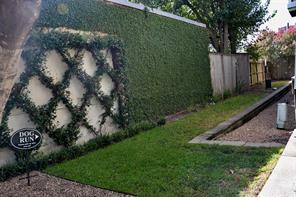 Herb garden and Lush Trees invite you to your privately gated, two story New Orleans style home. Enjoy a coffee on one of your balconies. Updated Kitchen makes this home cozy and inviting. It's a must see. Second floor hosts a large Master Bedroom, Walk in Closet , and another beautiful balcony that over looks the court yard. Pedestrian Friendly area with Stores like Costco, LA Fitness, Greenway Restaurants and much more. FABULOUS LOCATION, LOCATION, LOCATION! QUAINT SMALL CONDO COMMUNITY IN UPPER KIRBY (WITH 48 UNITS/HOA). CORNER UNIT WITH COVERED PARKING. 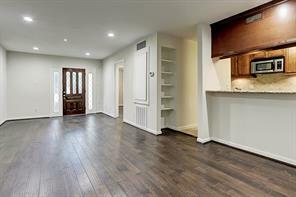 COMPLETELY REMODELED - EVERYTHING BRAND NEW: WOOD FLOORS, GRANITE AND TILE BACKSPLASH, APPLIANCES AND FIXTURES! ALSO A NEW EUROPEAN-STYLE WASHING MACHINE/DRYER INSIDE UNIT. WALK-IN CLOSET, PATIO. REFRIGERATOR INCLUDED. COMMUNITY SWIMMING POOL. MONTHLY MAINTENANCE FEE INCLUDES ALL UTILITIES INCLUDING ELECTRICITY AND BASIC CABLE TV. CURRENTLY TENANT OCCUPIED (INVESTORS ONLY). Awesome Greenway Location in Premier Complex. Trendy One Bedroom with 2019 Updates. Soft Neutral Tones - Beautiful Oak Flooring - Recessing Lighting. Large Open Kitchen with Serving Bar. Granite Counters. Cherry Custom Cabinets. 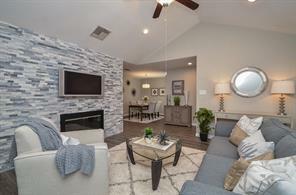 Spacious Living & Dining with Good Wall Space for Large TV. Extraordinary Closet Space. 12' Long Closet + Master Walk-in Close. Granite Bath Vanity. Property is Gated. Underground Assigned Parking. Pet Friendly. Dog Run. Gorgeous Resort Style Pool & Lounge Area. "All Utilities+Basic Cable-Insurance, Bldg, Grounds included in HOA Monthly Fee" Low Taxes. Walking Distance to endless Restaurants. LA Fitness - Costco - Highland Village - Central Market. Commute Downtown, Medical Center- Rice University. 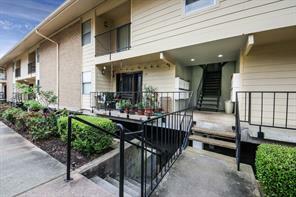 Updated 1 bedroom Greenway Plaza condo - ALL BILLS PAID (Electricity/Water/Trash/Sewer/Basic Cable/Exterior Maintenance). Walk to Costco & LA Fitness as well as area restaurants and shopping. 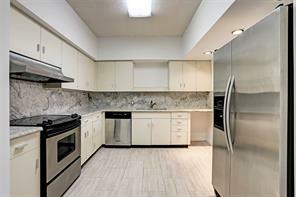 Recent updates include wood laminate flooring, paint throughout, granite countertops, brushed nickel fixtures/hardware and stainless appliances (refrigerator included). On site laundry, reserved covered parking spot in parking garage, well maintained grounds and renovated complex pool. Beautiful, updated condo in the heart of Greenway Plaza! You cant beat this location! It is within walking distance to Costo, LA Fitness, and too many restaurants to name! Fully updated condo with 1 bedroom, 1 bathroom, and an open layout living and dining. 2nd floor covered balcony over looks the court yard. Controlled access gates provide security for the property. Covered secure garage parking, beautiful pool, and on site laundry facility. All bills covered in monthly dues including: electricity, water, cable, exterior insurance, and maintenance. All utilities included! This immaculate unit was totally renovated last year with a new kitchen, bathroom, paint, flooring, baseboards, and more. Stunningly updated with quality upgrades in a chic contemporary style with: magnificent quartz countertops, new stainless steel kitchen appliances, custom white cabinets and an opened up layout with breakfast bar, fresh neutral paint, clean white subway tile in the bathroom and new recessed lighting in the kitchen, living room and closet. This gated community is incredibly well maintained with gorgeous landscaping and a sparkling community pool perfect for warm summers. 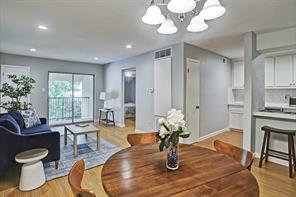 Coveted location within walking distance to Costco, LA Fitness and Central Market. 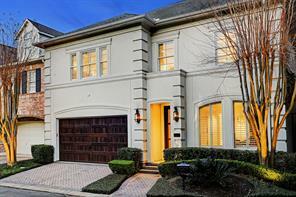 Just minutes from Highland Village, River Oaks District, Upper Kirby, and Galleria.